Despite the efforts of the United States and her allies to remedy the Libyan political crisis, Libya’s internal political infrastructure continues to deteriorate. Since 2015, Libya has effectively had two governments—one in the East and the other in the West. The Libyan Political Agreement (LPA) of 2015, hailed as a political solution by the global community, called for the creation of one unified national government, referred to as the Government of National Accord (GNA). In theory, the new government would have two major components: the executive and the legislative. The Presidency Council (PC), headed by Prime Minister Fayez Mustafa al-Sarraj, would be based out of Tripoli while the House of Representatives (HOR) would continue its presence in the Eastern city of Tobruk—a compromise to Eastern factions. Although the two bodies were intended to govern together, this is not the reality. Since the LPA’s inception, the HOR and the PC have not mitigated the differences between them, and have begun to act as independent, regional governments as opposed to one government entity. To make matters worse, a Qaddafi-era general named Khalifa Haftar wields political power in the HOR and has accepted defense-related responsibilities in the East, creating an additional challenge for the struggling, internationally-recognized government. Currently, the HOR is divided between members loyal to Haftar, who has recently become the face of the Eastern resistance, and members loyal to Prime Minister Sarraj. Following months of what can only be described as a political stalemate between General Haftar and Prime Minster Sarraj, the balance of power has shifted away from the Sarraj government—much to the dismay of the United Nations and the members of the global community that remain committed to a political solution. On August 22, the House of Representatives formally voted to reject the authority of the Government of National Accord. The vote of no confidence comes as a surprise, given that the HOR has failed to meet quorum for legislative sessions in the past. According to official reports, of the total 101 representatives in attendance, 61 voted against, 39 abstained, and only one voted in favor of the Sarraj government. Pro-GNA representatives, many of whom were not in attendance, claimed that the vote was “unannounced and unconstitutional.” While deep divisions between the HOR and the PC persist, the legislative body argued instead that the HOR’s rejection of the GNA is founded not on any personal dispute with Prime Minister Sarraj, but on a fundamental disagreement on the size of his government. The HOR has offered Prime Minister Sarraj an opportunity to retain his political legitimacy and regain popular support by consolidating the size of his government and eradicating regional biases (many still contend that the GNA is biased towards Western Libya); however, the latter remains a daunting and seemingly unachievable ideal. While the HOR’s response to the Prime Minister is official record, a deeper examination of the current challenges facing Libyan society reveals an entirely different narrative. Perhaps the legislative body’s disapproval of Prime Minister Sarraj stems not only from a disagreement with the size of his government, but is indeed heavily rooted in identity politics and a desire to strengthen the HOR’s own regional alliances. Following Muammar Qaddafi’s death in 2011, a quest for political legitimacy dominated Libya. In Weberian terms, politics still held traditional importance—tribal and regional affiliations were a necessity for any political endeavor—but the opportunity to earn political legitimacy through charisma (i.e. Haftar’s political campaign in the East, also referred to as Operation Dignity) all of a sudden became a new addition in Libyan politics. Most recently, the Libyan Political Agreement, a compromise intended to rectify the political and regional differences between the East and the West, perpetuated the notion that the distribution of power in Libya was a binary concept—that power was divided between the Tripoli and Tobruk factions and reconciliation between the two was only a matter of time. It also advanced the idea that while deep divisions persisted, the newly created government was slowly building legitimacy and would eventually receive a mandate to govern from the Eastern factions. The HOR’s recent vote of no confidence should dismantle that idea. In the Libyan context, the state’s capacity is tied to the extraction and export of oil. In June of 2016, Libya’s barrel per day production fell to 320,000, a sharp decline from the pre-revolution levels of 1.6 million bpd. In July of 2016, the UN-backed government came to an agreement with the Petroleum Facilities Guard (PFG), a militia group blockading Libya’s oil ports since Qaddafi’s death, to open oil ports in the country; however, the deal between the two parties was contingent on a large cash transfer to the PFG. Many derided this agreement as compensation to alleged terrorists and as an act that empowered a militia group with an essential state task. Following the announcement of the deal, PFG representative Ali al-Hassi cited reports of threats made against the group from the Eastern Libyan National Army, headed by General Haftar. In my conversation with Ahmed Sanalla, a commentator on Libyan affairs, he told me that while the Libyan National Army (LNA) had made serious threats against several oil ports in the region, the LNA’s strong stance against the deal was a rejection of the GNA’s authority and a rejection of those leading the Western faction. Soon after the vote of no confidence in the Tobruk legislative body, the PFG announced the closing of the Hammad oilfield. While official press releases indicate salary concerns, the optics of closing a vital oilfield in the Oil Crescent soon after a vote of no confidence does not bode well for the GNA’s governing and negotiating authority. Security challenges are also of major concern to both the GNA and Operation Dignity. Any disruption in their respective territory signifies a setback in their state building enterprise, and a loss in their popular legitimacy. Since August 1st, the United States, alongside the GNA forces, has been engaged in tactical airstrikes against Islamic State of Iraq and the Levant (ISIL) in the coastal city of Sirte. In theory, defeating ISIL in Sirte represents an important victory against the self-proclaimed Islamic state. Here’s why: many Salifists, particularly those in the ISIL leadership structure, believe in a religious phenomenon known as the Battle of Dabiq, which claims that the final battle before Judgment Day will be fought in the Syrian city of Dabiq against the “armies of Rome.” Although the word “Rome” should not be taken literally, many Salifists view this theological concept as simply a reference to the West, and as an idea that gives credence to the notion that the West is indeed the enemy. Denying ISIL sanctuary in this North African city, (Sirte is extremely close to the Southern European Border) then, does two things: (1) it creates the perception that ISIL’s advances in constructing an Islamic emirate are on the decline, and (2) it minimizes the threat of ISIL’s expansion into Europe. Nevertheless, the United States’ campaign in Sirte has been met with equal parts controversy and criticism. Some critics cite reports of militants, aligned with the Islamic State, fleeing Sirte in order to avoid becoming collateral damage from a US airstrike. Some contend that this represents a fragmentation of the Islamic State network in Sirte (a positive outcome in their eyes), yet, some also argue that this perpetuates the localization of terror. As militants flee the coastal city and relocate to rural, ungoverned territories within Libya, they are able to embed the same philosophy in a much smaller context, which is arguably tougher to defeat. A militant group’s attempt at consolidating power in a relatively ungoverned space and establishing a monopoly on the distribution of public goods robs the official government of the opportunity to build national legitimacy. While many focus on ISIL as Libya’s primary security threat, the issue of security challenges extends further. 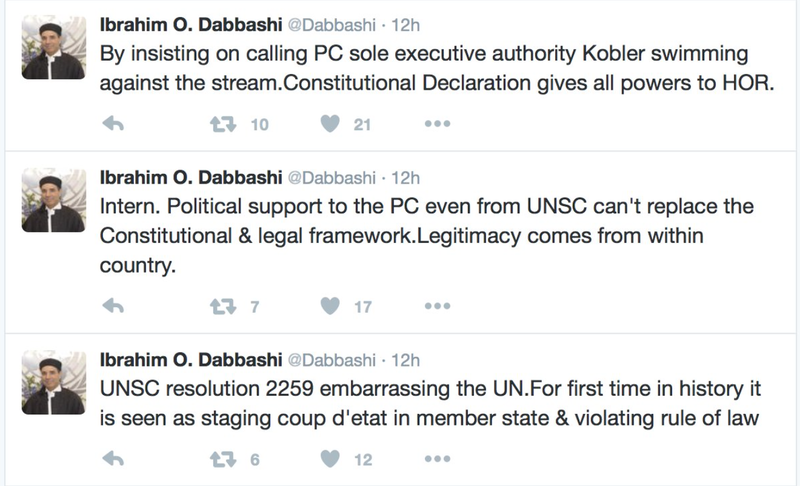 Ibrahim Dabbashi, Libya’s ambassador the United Nations, recently launched an attack on Twitter against the UN’s backing of the GNA. Although Dabbashi’s attack is against the UN’s alleged imposition of Libya’s national sovereignty, the ambassador’s complaint speaks to a larger issue: for many Libyans, the United States’ aggressive support for what is perceived to be an unconstitutional, internationally supported government is, in fact, antithetical to the United States’ initial backing for democratic movements in 2011, when the United States quickly dropped support for decade-long ally Hosni Mubarak and voiced support for a democratic transition in Egypt. The United States’ campaign against ISIL, then, is capable of achieving tactical success, but it also retains the possibility of exacerbating the current security climate by creating an “us vs. the West” dichotomy. In addition to militants exploiting the United States’ unsolicited involvement in Libyan affairs, the United States’ operations in the North can also facilitate the radicalization process, particularly for the country’s youth—an undesirable result for a country already struggling with deep fragmentation. For many Libyans, the UN’s actions in the country prove what Libyans already understand—that the creation of a new government does not always result in effective governance. While the Libyan situation looks bleak, there are days on which the GNA seems to be on the right track. On September 2nd, CNN reported that approximately five hundred tons of chemical weapons material were removed from Libya, a strong step that prevents any side of using chemical weapons as a means to accomplish its political ambitions. Still, it’s important to bear in mind that these isolated incidents of progress do not indicate a newfound legitimacy for the GNA. Libya remains deeply divided, oil production is stagnant, Libyans are increasingly weary of the new government, militia groups dominate the country’s security infrastructure, and the introduction of the self-proclaimed Islamic State has further complicated this already complicated endeavor in state-building. It is tempting to imagine all Middle Eastern conflicts as the same—pure consequences of Islamic extremism; however, behind the veil of ideological purity lies the true root of the conflict: the quest for territory.